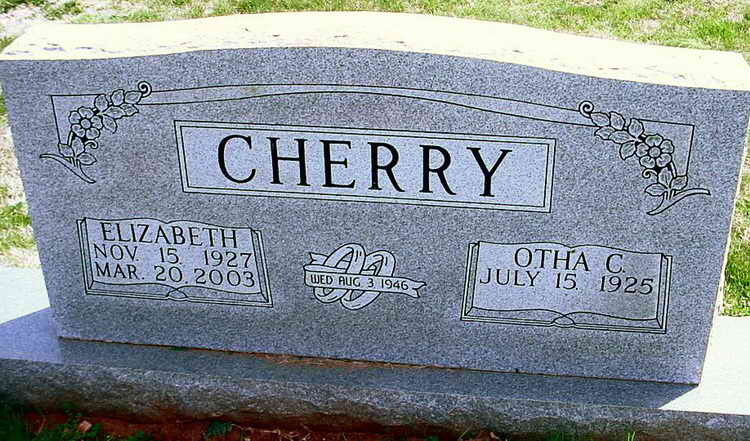 Grave marker for Otha C. Cherry in the Fairview Cemetery, Bowling Green (Warren County), Kentucky. He was a m ember of Company F during WW-II and fought in the Ardennes Campaign. Note that the inscriptions shown were all accomplished when his wife Elizabeth died n 2003. His date of death has not yet been added. Otha C. Cherry, 85, of Bowling Green, died April 29, 2011, at The Medical Center. The Warren County native was born July 15, 1925. He was a member of Rich Pond Baptist Church, the American Legion and was a U.S. Army veteran. He was a son of the late Cornelious and Julia Harris Cherry. He married Elizabeth Jewell in 1946 and she preceded him in death in 2003. He married Opal Brown Cannon on July 29, 2004, in Bowling Green. He was preceded in death by a son, Michael Glen Cherry; two brothers; and four sisters. Funeral is at 2 p.m. Monday at Stoner Family Funeral Home, with burial in Fairview Cemetery. Visitation is from 1 p.m. to 5 p.m. today at the funeral home. Survivors include his wife, Opal; a son, Gary Cherry and his wife, Susan, of Cross Plains, Tenn.; a daughter, Judy Hunt and her husband, Tim, of Bowling Green; a grandson, Alex Cherry and his wife, Amy, of Tompkinsville; a granddaughter, Amy Curry and her husband, Travis, of Bowling Green; two great-grandchildren, Morgan Curry and Alex Cherry; and three stepsons, Mike Cannon and his wife, Edwina, Danny Cannon and his wife, Penny, and Craig Cannon, all of Bowling Green.